The South Carolina Future Makers initiative offers companies, schools, community-based organizations, and other stakeholders the opportunity to partner to promote top tier career choices in our State. Future Makers promotes opportunities in technology to three distinct target markets: student, parents, and educators. 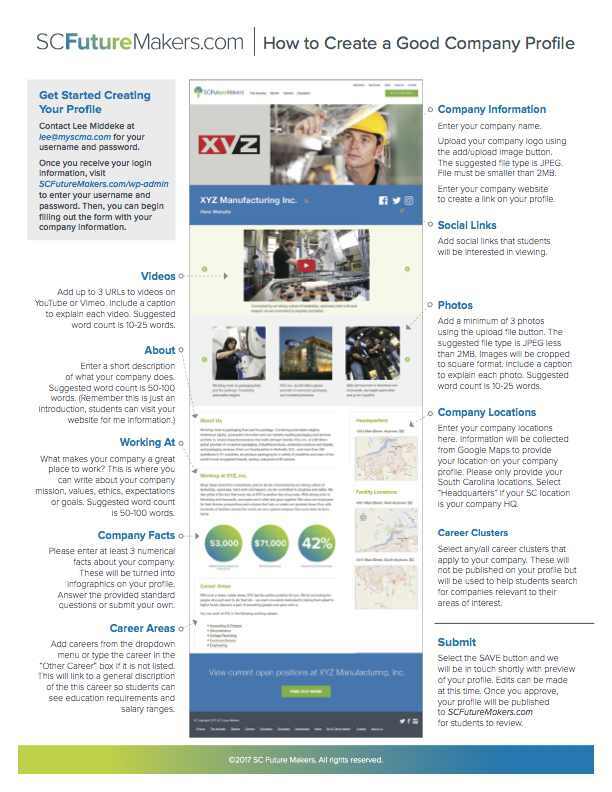 Creating Your Profile Is Easy Companies build your free profile and show students what you’re all about. Enlighten & Educate Provide a brief description about of your organizational culture and what your company does. Upload Videos & Photos Don’t just tell them, show them. Bring the next generation into your facilities and showcase your products by adding videos and photos. Link & Connect Add links to your website and social media channels so students can keep up with your latest happenings. Post Opportunities Link your career page for students to connect to opportunities such as internships, apprenticeships, and co-ops. Choose Career Areas Choose from a dropdown menu of careers that link to general descriptions about the career’s educational pathway, salaries, skills, etc. Your company profile is to introduce your company to 15-year-old to 22-year-old high school and college students who are making decisions about what skills they need to learn, what apprenticeships to apply for, and what careers they want to pursue upon graduation. What would a high school student want to know about your company? Keep it simple. To ensure digital security of corporate identities, we verify every organization. 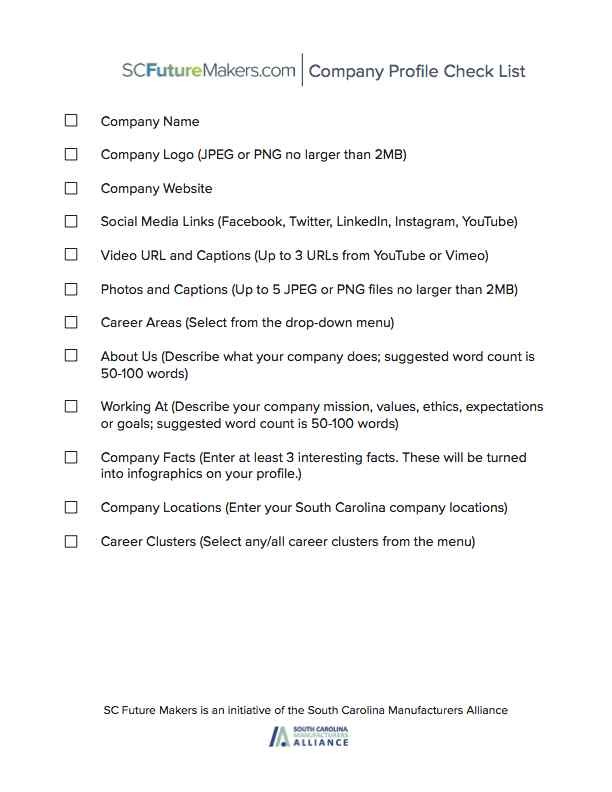 Gather video links, product pictures, and content using the company profile checklist. Staff will review the submitted content and provide a password protected page for company representatives to review and approve.